I have long been reporting on Castro-ruled Cuba and, indeed, was there not long after Fidel Castro had taken over the country. What became clear, as the number of Castro's political prisoners increased, was that his revolutionary Cuba was a dictatorship, like the regime he had ousted. After I wrote that, a member of his administration rebuked me for my rank ignorance. I responded by saying that he knew that if I were a Cuban in Cuba, I would be in prison. Later, at the United Nations, I was one of a number of reporters interviewing Che Guevara, the young, dashing Latin American revolutionary who had acquired fans among many American college students. Sitting by his side that day was a translator; we had been told he could not conduct an interview in English. I asked him: "Mr. Guevara, can you see at any time in the future when there might be elections by freedom of choice in Cuba?" Without waiting for the translator, Guevara burst out laughing, saying: "Aqui? In Cuba?" I kept reporting -- often using sources from within Cuba that I cannot, for their sake, name -- details about the impact of the dictatorship. For example, kids who heard their parents criticize Fidel were required to inform the authorities. Currently, Cuba is under the active leadership of Raul Castro, who is not markedly different from his brother. In The Wall Street Journal last week, Florida Sen. Marco Rubio, whose parents fled Cuba to live here in freedom, declares "it has been the policy and law of the U.S. to make clear that re-establishing diplomatic and economic relations with Cuba is possible -- but only once the Cuban government stops jailing political opponents, protects free speech, and allows independent political parties to be formed and to participate in free and fair elections" ("A Victory for Oppression," Marco Rubio, The Wall Street Journal, Dec. 17). "The opportunity for Cuba to normalize relations with the U.S. has always been there, but the Castro regime has never been interested in changing its ways. "Now, thanks to President Obama's concessions, the regime in Cuba won't have to change." I can still hear Che Guevara laughing at my question about the future of free elections there. Of course, there'll be changes in the economy, but I continue to have regular access to news from inside Cuba of the Castro brothers' stifling dissent. I am still trying to establish indirect contact and even talk with some of the prisoners I know. In The Washington Post, Philip Rucker reports on Kentucky Sen. Rand Paul's and Rubio's opposing views on U.S.-Cuba relations, "evidence of a growing GOP rift over foreign affairs that could shape the party's 2016 presidential primaries" ("In Paul-Rubio feud over Cuba, a preview of GOP's 2016 foreign policy debate," Philip Rucker, The Washington Post, Dec. 19). Rucker cites Paul's Dec. 19 op-ed in Time magazine, where the senator wrote: "Communism can't survive the captivating allure of capitalism. Let's overwhelm the Castro regime with iPhones, iPads, American cars and American ingenuity" ("Cuba Isolationists Just Don't Get It," Rand Paul, Time magazine, Dec. 19). Meanwhile, Rucker highlighted Rubio's criticism of Obama's welcome to the Castros: "It's just another concession to a tyranny by the Obama administration, rather than a defense of every universal and inalienable right that our country was founded on and stands for." Well, our presidents and members of Congress hardly ever do fully stand for those definitions of who we are, but they are supposed to explain our reason for being. Speaking of those who defend our "universal and inalienable rights," Brothers to the Rescue is an organization of pilots based in Miami that provides humanitarian aid to Cubans trying to escape their dictatorial homeland. Jose Basulto, the group's founder, expressed his frustration with the president's new Cuba policy to WSVN, a Miami-Fort Lauderdale news affiliate: "Obama has elected himself as the new king of America, and he feels free to take any type of actions, even if he has to (bypass) the justice system of the Unite States." His is a sentiment that I have expressed many times. Added Sylvia Iriondo, a Cuban-American human rights activist: "President Barack Obama's concessions, it's sending the wrong message to the free world and to the world that terrorists can get away with murder." Responding to the article in the comments section on WSVN's website, Alberto Robles asked a question that I also ask of the president: "How about the thousands of political prisoners in cuban (sic) jails?" And Miriam De La Pena, the mother of Mario De La Pena, one of four men whose planes were shot down by the Cuban government during a mission for Brothers to the Rescue, exclaimed: "I'd like to say that not only do I feel that I've been slapped in the face by a president, I feel that the justice system of the United States of America today has suffered a big blow." According to WSVN, she said that "as she fought back tears." 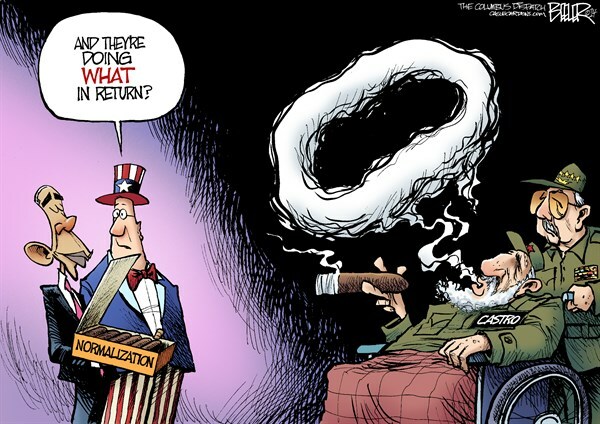 In this country, I was surprised and disappointed that libertarians such as Rand Paul were grateful for Obama's elevation of Cuba. Not only will the Castro brothers remain free of punishment, but now they are globally uplifted.